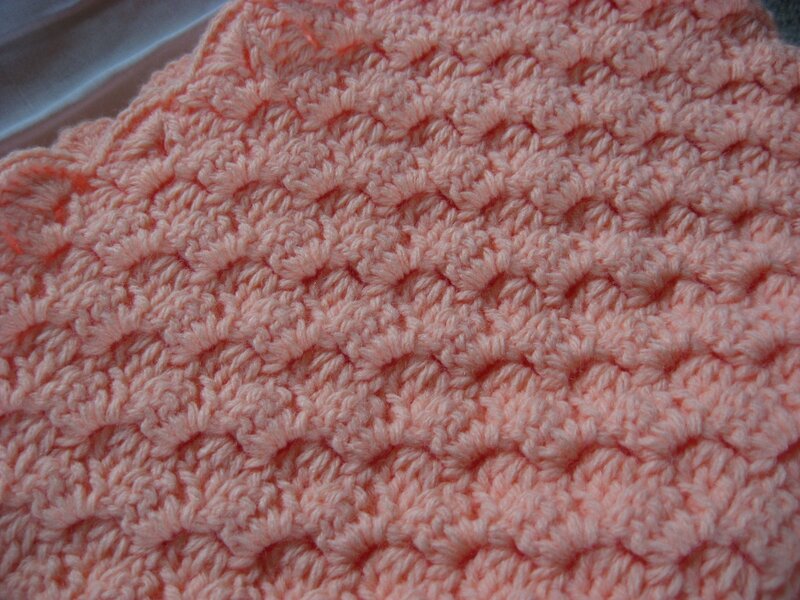 Hooked on Needles: Summertime Crochet ~ No complaints here! 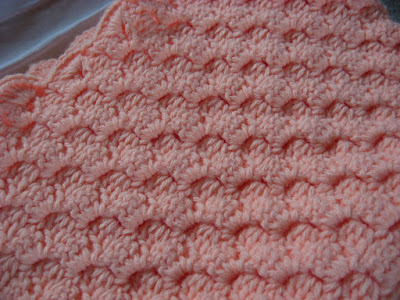 Crocheting afghans is not usually something I do in the summertime since it usually requires heavy yarny stuff sitting on my lap in the hot, humid weather. But this summer, we have actually enjoyed very mild weather with warm days and cool evenings. But now that our local pool has closed for the season and we are preparing to get back into our school year routine, the hot and humid weather has arrived with a vengeance. Typical New England weather! Doesn't Kit just look so cozy and ready for winter? This little doll blanket was crocheted using the diagonal box stitch, and is the perfect size for Kit's little bed. 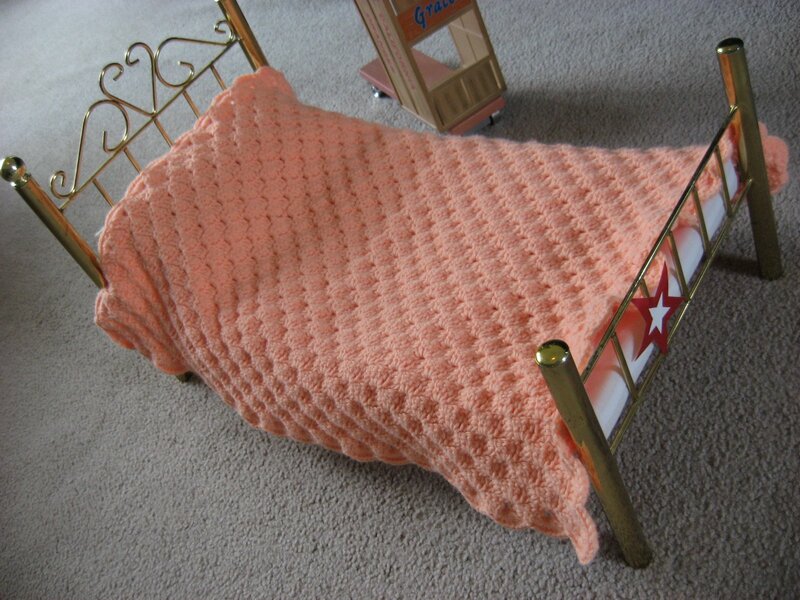 The soft creamsicle color will be a good reminder of the nice summer weather when it was made! 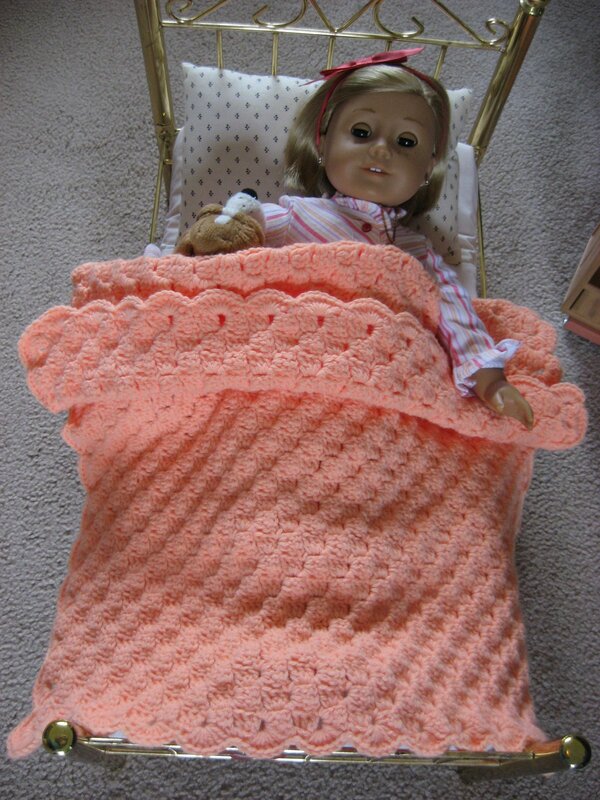 This little blanket would be a nice addition for any little girl's doll accessory collection, and can be seen over at my Etsy shop while it lasts. 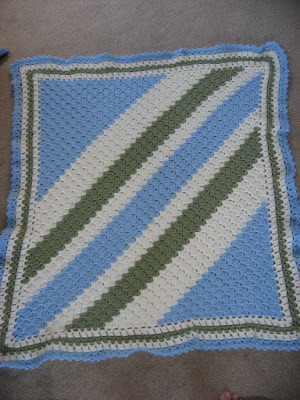 This is the baby blanket I crocheted for Crystal's baby boy, who, I found out yesterday, was actually born last week! It's a good thing I finished it when I did! We had a little baby shower for Crystal a few weeks ago and one of the games we played was trying to guess what length of yarn matched the distance around her very pregnant middle. I didn't win the game, but I did get to take home the skein of yarn to make something nice for the baby! This blanket was also crocheted using the diagonal box stitch for the body of the blanket. 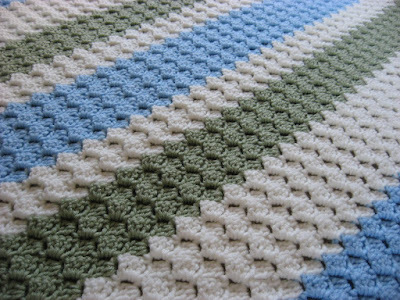 The border was a simple two round pattern of single crochet/chain 3 for the first round, and then 3 double crochets in each chain 3 space for the second round. 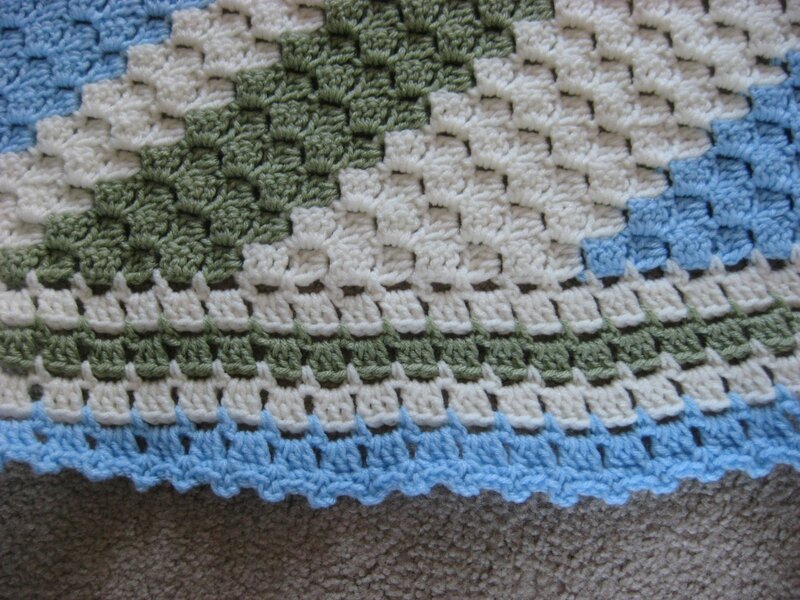 I did that with each color, and ended with one round of (single crochet/chain 3/single crochet, skip a stitch, single crochet, skip a stitch) for the last round. 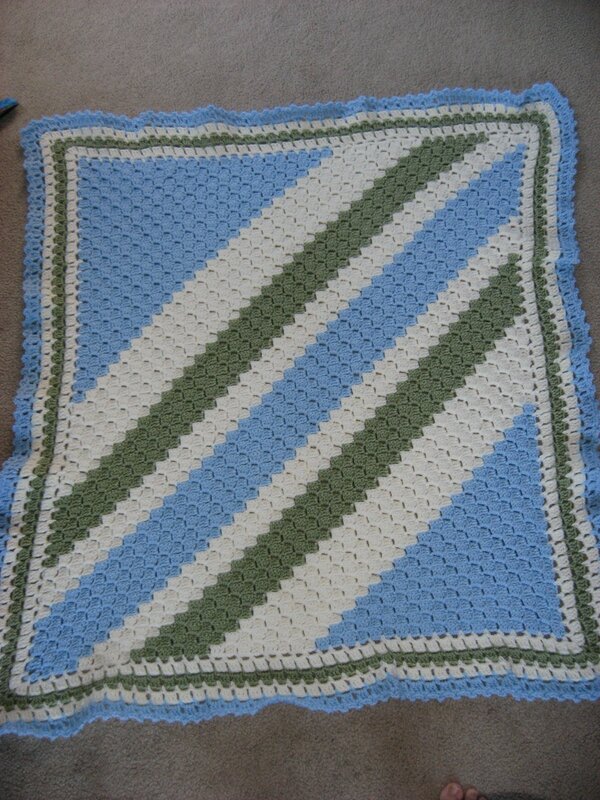 I think the little nipper will be quite cozy with this blanket for many years to come! 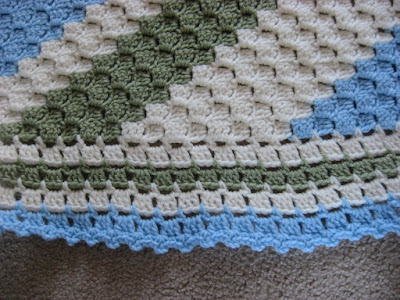 Is summertime a crochet season for you? 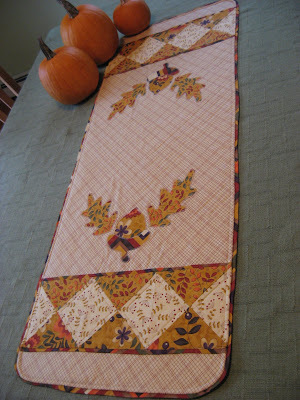 Or do you save it for cooler weather? 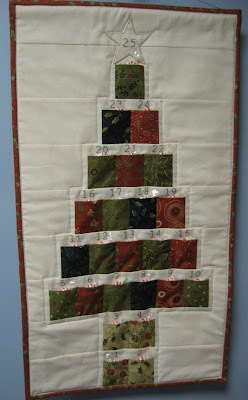 Impromptu Quilt ~ Finally Finished!